In this blog, the third in our introduction to Growth at a Reasonable Price strategies, we look at risk and return. The main objective of the S&P 500® GARP Index is to capture the performance of growth stocks with relatively high quality and value composite scores over a long-term investment horizon. Historically, the GARP strategy has delivered higher returns than the underlying benchmark. Rebasing all indices to 100 on June 30, 1995, the S&P 500 GARP Index reached 1,631.76 on Jan. 31, 2019, while the S&P 500 reached 777.91. 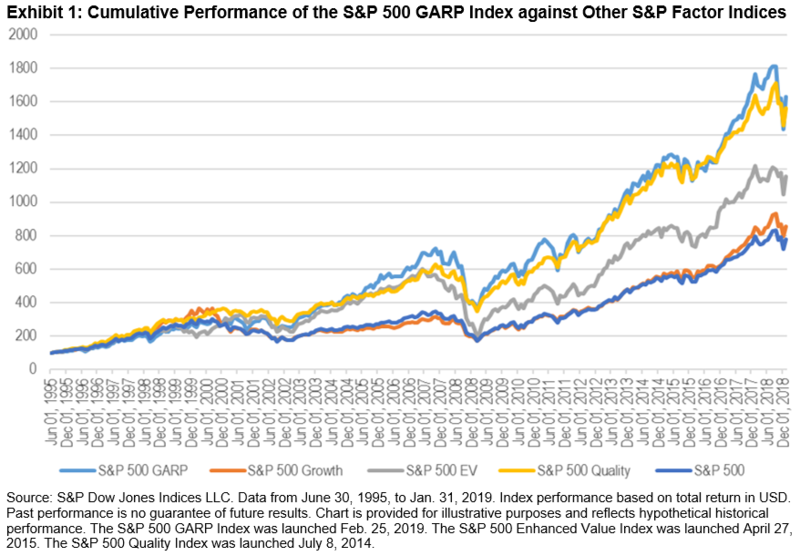 In Exhibit 1, we compare the performance of the S&P 500 GARP Index with other factor indices - the S&P 500 Growth (855.24), the S&P 500 Enhanced Value Index (1155.30), and the S&P 500 Quality Index (1564.67). Exhibit 2 shows the average risk/return profile of the S&P 500 GARP Index against single-factor indices. The S&P 500 GARP Index had the highest annualized average return, at 13.48%. On a risk-adjusted basis, the S&P 500 GARP Index ranked second (0.76) after the S&P 500 Quality Index (0.93), but was higher than the other factor indices - the S&P 500 Enhanced Value Index (0.66) and S&P 500 Growth (0.67) - as well as the S&P 500 (0.67).